A man claiming to be a professional clown who planned to rally outside a New York City movie theater, complaining his business suffered because of marketing around the horror clown movie "It," admitted Thursday the protest was a sham -- a publicity stunt designed to promote the very movie he said cost him cash. John Nelson conceded on WOR-710's that he had been hired, though he wouldn't say who had paid him. Neither New Line Cinema, the studio behind the film, nor its parent company, Warner Brothers, has returned calls for comment. 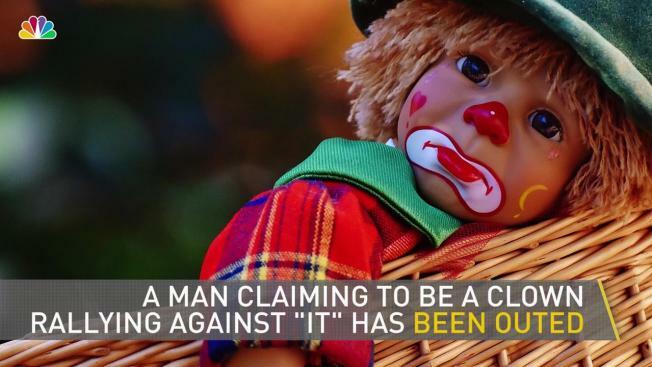 Nelson had told News 4 earlier this week that his alleged business, Clowns in Town, received six cancellations in the last few weeks. He claimed the supernatural horror movie was scaring the public away from clowns. "Last week, my partner and I had six cancellations of birthday parties," he said Tuesday. "I have heard reports from other clowns, in New York and other cities, that they have been canceled as well." He said billboards and TV ads promoting the movie have been showing scary clowns, and Google search of "clown" shows scary clowns, like from "It." Nelson claimed to have studied clowning upstate and that he had been working as a clown in the New York area for 10 years, doing mostly children's parties. He said most clowns get paid on site and no deposit is required, so the cancellations "result in a huge loss to our livelihoods." He said he, along with a group of other local clowns, planned to rally outside Union Square Regal Cinema Thursday evening. "Our hope is to raise enough awareness so when people think of clowns they won't think of scary murderers but people who dedicate their lives to bringing joy," Nelson had said. WOR-710's "Len Berman and Todd Schnitt in the Morning" got a hold of Nelson Thursday morning with the help of News 4, and Nelson insisted at first his business was "100 percent real." "I'm not the only clown who's been upset about this, that the movie 'It,' as well as the portrayal of clowns in pop culture over the last 20 years has really hurt business for us," Nelson said on air. "It's scary, it doesn't make you want to go out and book a clown for a children's birthday party." He said there were 10 clowns committed to the rally at the movie theater later Thursday. But when News 4 went to the theater, no one was there. But WOR-710 host Todd Schnitt kept prodding Nelson. Nelson stuttered a bit and ultimately admitted it was a stunt. "You've exposed me," he said. "Look, this is gonna get me in a little bit of trouble. We were hired to do this for promotional purposes." He refused to disclose who hired him and hurried off the phone, saying, "We'll be there later today," promising the so-called clown rally would still go on at the theater. News 4 left a follow-up message with Nelson. A website for his purported business does exist, though the domain name appears to only have been registered two days ago. Despite the hoax, fear of clowns does exist -- as much as 2 percent of the adult population could have a real fear of clowns, called coulrophobia, Smithsonian magazine reported in 2013, citing the estimate of a veteran psychologist who runs a phobia and anxiety treatment center in San Diego. There's a long historical and psychological run-up to the increasing association of clowns as sinister, and Smithsonian.com reports it's hard to tell where the future of the clown lies. The movie "It," based on the 1986 Stephen King novel, tells the story of a group of bullied kids who band together when a shapeshifting demon, taking the appearance of a clown, begins hunting children, according to its synopsis. Editor’s Note: This story has been updated based on new reporting that shows that the clown rally is in fact a promotional stunt.